Hat tip to Dan Steinberg at DC Sports Bog for this one. My fantasy football draft party is this Sunday. I’m already dreading going to the store and picking up posterboard to make that damn draft board for the seventh straight year or whatever it is (stop being a cheapskate and just buy one, I know. Too late, unless you know somewhere that I can go out and get one instead of ordering it online). Anyway, your fantasy draft/s is/are probably soon too. You know who else’s is soon? The Baltimore Orioles’ team league. And, according to Darren O’Day, the Birds have no use for the typical “pick your name out of a hat” process to choose their draft order. They instead went with that time-honored Maryland tradition, the Crab Race. 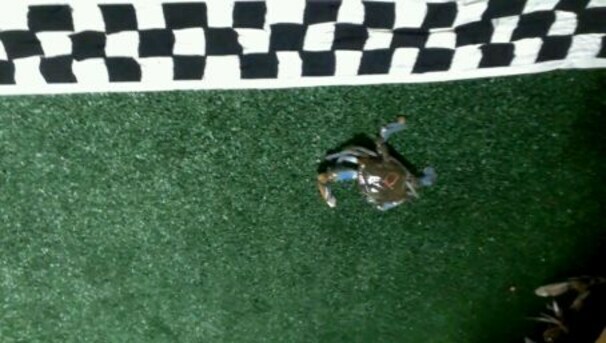 Because, you see, the Orioles held a crab race to determine the order of their fantasy football draft. “Thanks to Cravin’ Crabs for providing the athletes for the Orioles fantasy football draft order crab race,” O’Day wrote on Wednesday. So I feel comfortable saying that the Orioles apparently held a crab race to determine the order of their fantasy football draft, or possibly Darren O’Day was just making a joke. This entry was posted on August 15, 2012 at 12:04 pm and is filed under Orioles, Random. You can follow any responses to this entry through the RSS 2.0 feed. You can skip to the end and leave a response. Pinging is currently not allowed.